We’re looking forward to another great 2Cool Art Show hosted by the Professional Association of Visual Artists, the City of Gulfport and the Gulfport Downtown Merchant Association, and held in an historic building that has been referred to as the “heart and hub” of Gulfport, the 2Cool Art Show is now in it’s eighth year. 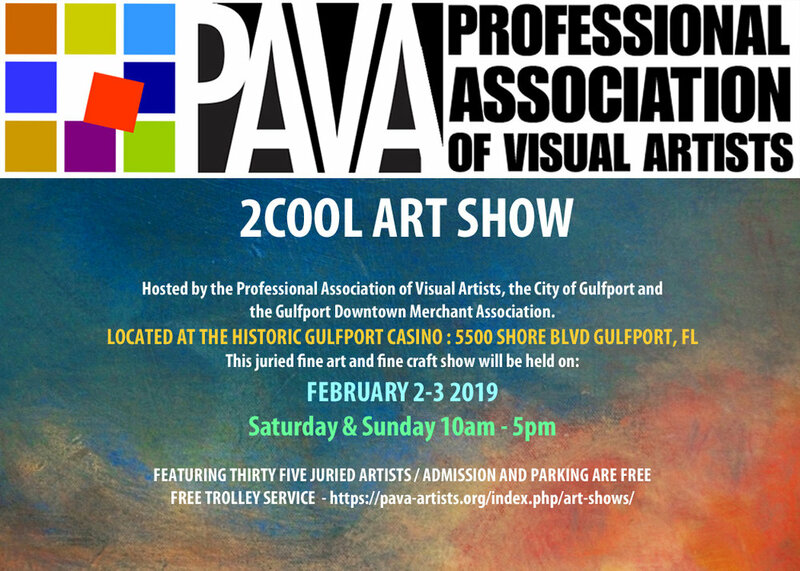 This juried fine art and fine craft show, PAVA’s second premier exhibition, is held in February each year at the Gulfport Casino. Located on the waterfront at 5500 Shore Blvd., it gives winter visitors a sampling of the high caliber work for which the summer Cool Art Show is so well known. Thirty five juried artists show and sell a variety of hand crafted visual and functional works in paint, wood, ceramics, photography, metal, glass, mixed media and jewelry. Admission and parking are always free. The next 2Cool Art Show is slated for February 2 – 3, 2019. If you have any questions about the Art Show, contact Dacota vicepresident@pava-artists.org.